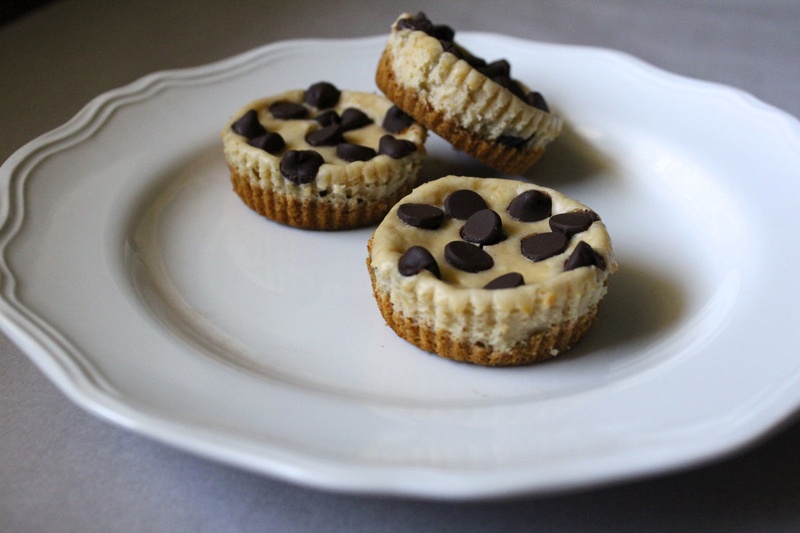 Happiness Project Recipe #27: Mini Chocolate Chip Cookie Cheesecake Cups! Preheat your oven to 350F. Line 12 cupcake tins with paper baking liners. In bowl #1, mix together the graham cracker crumbs with the brown sugar and salt until well combined. Pour in the melted butter and mix with your fingers until evenly coated and crumbly. In a 2nd large bowl, on a stand mixer, cream together the cream cheese, sour cream and sugar until smooth, scraping down the sides of the bowl to prevent any lumps in the batter from forming. Beat in the egg and vanilla extract until well combined. Set aside. In your cupcake pan, scoop up about 1-1/2 tablespoons of the graham cracker crust into each paper liner, pressing the crumbs down into a nice, even layer. Now, evenly divide the cheesecake batter between the cupcake liners, pouring the batter over the graham cracker bottom, filling each liner nearly to the brim. Sprinkle however many mini chocolate chips over the top of the cheesecake batter as you desire. Bake for 18-21 minutes until the tops are nearly completely firm to the touch. Remove the cupcake pan from the oven and cool on a wire rack for about an hour before popping them into the refrigerator for another 2 hours to let them set up correctly. When not serving immediately, store in a airtight container in your refrigerator for up to 3 days. « Happiness Project Recipe #26: Funfetti Birthday Cookies!